When it comes to bridesmaid dresses, I have to admit that I do typically find myself gravitating towards the longer gown styles. Especially the kind with flowy, chiffon type fabric like these. Mix in a flattering neckline like these sweetheart styles or a one shoulder style and I'm sold! And so when I got the request to put together some bridesmaid style ideas incorporating dresses I love, I couldn't wait to get started! Admittedly, I'm a huge fan of Jenny Yoo, Donna Morgan, and Aidan Mattox. Trust me: If you haven't found your bridesmaid dresses quite yet, these are definitely designers you want to check out! As you can see, no matter which color you go with, there's really no shortage of gorgeous ideas to coordinate. And I'll just go ahead and say it now: If I were a bridesmaid in your wedding, I'd be totally happy with any of these choices. They're sweet, they're flattering, and they have just the right amount of sophistication and elegance. 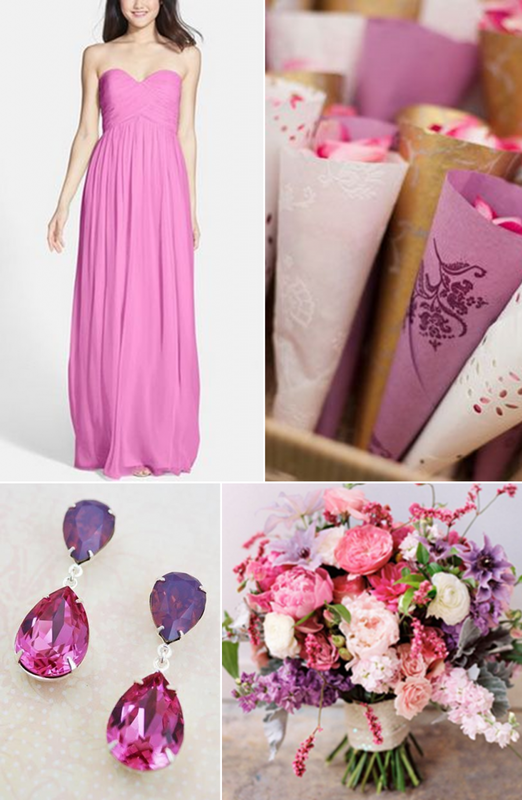 11 Comments " Hues You'll Heart: Bridesmaid Dress Edition "
These are all so great! Really loving that black dress. It's definitely a dress that could be worn again! love! my fave is the gray look! but agreed, Donna Morgan is everything! These are all so pretty. I think my favorite is the gray. Loving all of these but particularly loving the gray look! Love all these looks. So hard to choose, but I think I'm leaning more towards the gray and blue and my favorites. Gorgeous bridesmaid options! So smitten with those Jenny Yoo and Donna Morgan dresses!! I am such a sucker for pink so I'm obsessed with the first look, but all of them are so pretty! That pink is gorgeous! I agree, I love the romantic look of a long flowing dress. No shock here, but I love the black and gray looks!